A Blog Hop on Jack Heckel’s site with information on the main character of Once Upon a Rhyme. Welcome to the Meet My Main Character blog hop! Thank you to Katherine Harbour for inviting me. 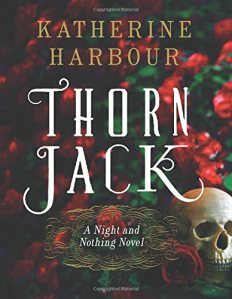 She’s one of my fellow Harper Voyager authors and shares my love of fairy tales, inviting her readers into the world of Night and Nothing with Thorn Jack, a dark fantasy retelling of the ancient Scottish ballard, Tam Lin, set in upstate New York. You can find her book here: Amazon in harcover, paperback, Kindle and audiobook. You can learn more about her heroine, Finn Sullivan, and how she has to overcome tragic loss and find a way to outwit the supernatural at Katherine’s blog: Katherineharbour.blogspot.com.